Efforts to control the sale and consumption of alcohol in the United States developed as early as the eighteenth century. By 1825, the first organized temperance society, The American Temperance Society, was established. 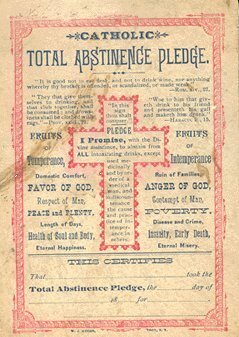 In the nineteenth century, temperance movements such as the Women’s Christian Temperance Union (WCTU), established in Cleveland, Ohio, November 18, 1874, strove to wipe out intemperance and reform society of the ills associated with drinking, such as immoral behavior, spousal abuse, and poverty. The WCTU, while not specific to one denomination, was dominated by Protestants and often directed its efforts against Catholic immigrants. 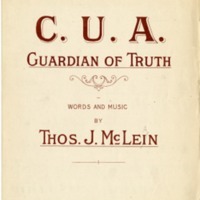 The Catholic counterpart to the WCTU was the Catholic Total Abstenance Union of America. As a priest, Lindesmith took his role as moral guide seriously. In Ohio and later as a military chaplain in Montana, he urged many to take “the Pledge” and avoid drinking.